In this section, you’ll learn how to create editable type, then style and format it using a wide assortment of character and paragraph controls. You will also learn special techniques, such as how to transform type, screen it back, rasterize it, and make it look like cut paper. 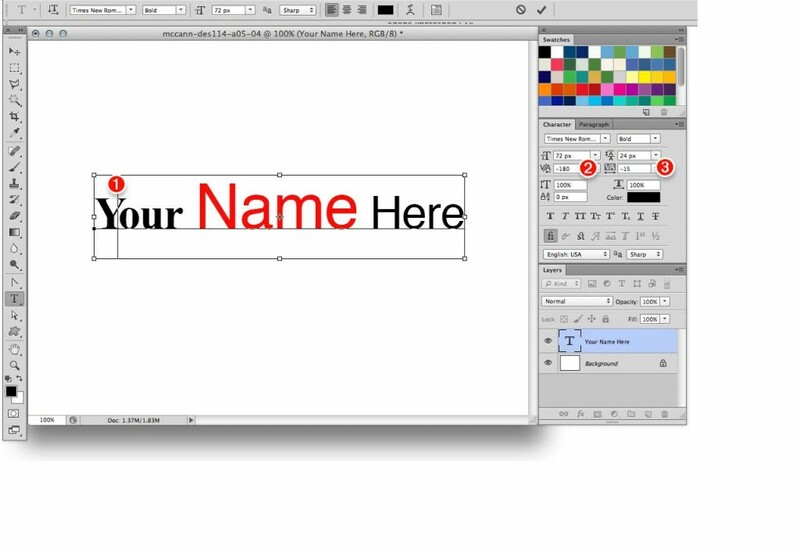 Finally, you will learn how to put type shapes into a spot color channel. When you use the Horizontal Type tool or Vertical Type tool, editable type appears in your document and a new layer appears on the Layers panel. You can easily change the attributes of editable type’ such as the font family, font style, and size; kerning, tracking, leading, alignment, and baseline shift values; and color. Moreover, you can transform, warp, or apply layer effects to editable type; change its blending mode; and change its opacity and fill values.To style type, you can use the Character panel, the Paragraph panel and the Paragraph Styles panel, the Character Styles panel, or the Options bar. You can apply Character panel attributes to all the type on a layer or just to selected characters or words. 1. On the Layers panel, click a type layer. Choose the Horizontal Type tool or Vertical Type tool, then click the Text Color swatch on the Options bar. On the Character panel, click the Color swatch. 3. Choose a color via the Color Picker or Swatches panel, or click a color in the image, then click OK to exit the Color Picker. You can also apply a color, gradient, or pattern to a type layer via an editable overlay layer effect. 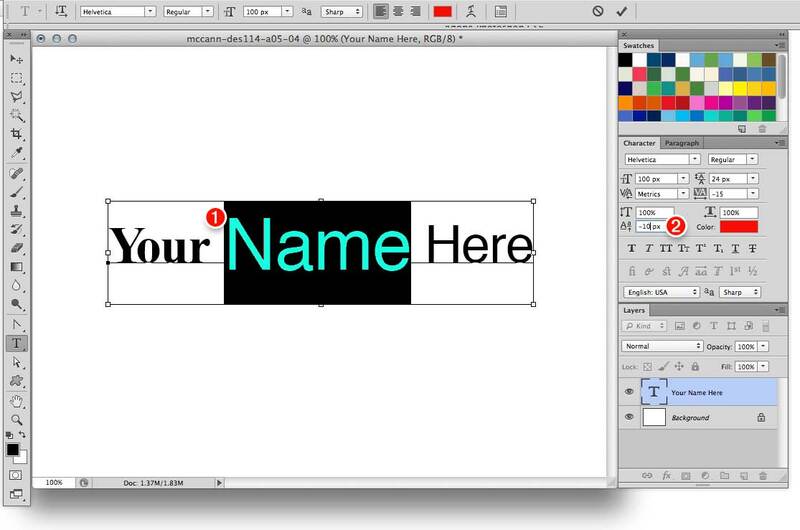 1 With the Horizontal Type tool or Vertical Type tool, select the characters or words to be recolored. On the Options bar, click the Text Color swatch. 3. Follow step 3 in the previous section above. 1. Select the type to be restyled (use any method from the preceding page). 2. On the Options bar or the Character panel, choose from the Font Family menu, then choose from the adjacent Font Style menu. To deal with missing fonts in a file. From the Type > Font Preview Size submenu, you can choose a size (e.g., Small, Medium, Large) for the sample of each font family that displays on the font menus in Photoshop. Note: If the samples are previewing too slowly, choose a smaller preview size or None. If the Character panel is open but collapsed to an icon, click the icon. Select the Horizontal Type tool or Vertical Type tool, then click the Toggle Character and Paragraph Panels button on the Options bar. Choose Type>Panels>Character panel or Window > Character. With a Type tool, drag across the characters to be recolored, then click the Text Color swatch on the Options bar. 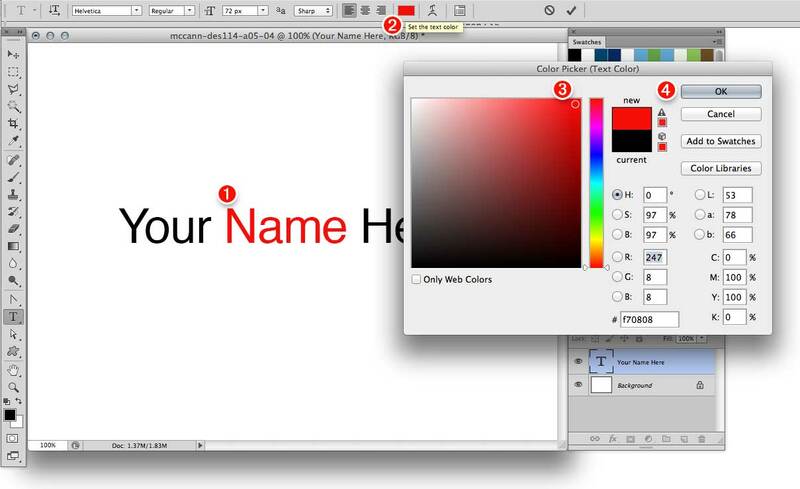 Choose a replacement color from the Color Picker. On the Layers panel, right-click the name of a paragraph type layer and choose Convert to Point Text. A line break will be inserted at the end of every line of type except the last one. If the type object contains hidden (overflow) text, an alert dialog may appear, warning you that the hidden text will be deleted if you proceed; click OK.
On the Layers panel, right-click the name of a point type layer and choose Convert to Paragraph Text. Be sure to delete any unwanted hyphens that Photoshop may have inserted. 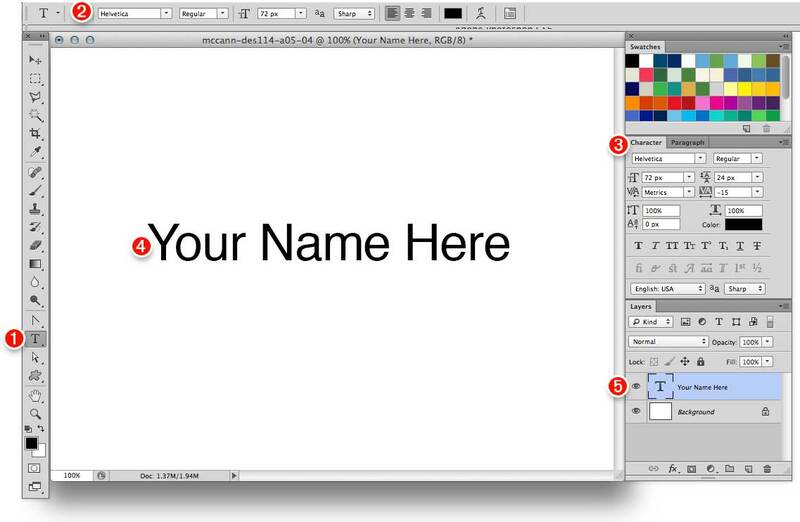 To assign a specific font (point) size to type, you can use either the Options bar or the Character panel. 1. 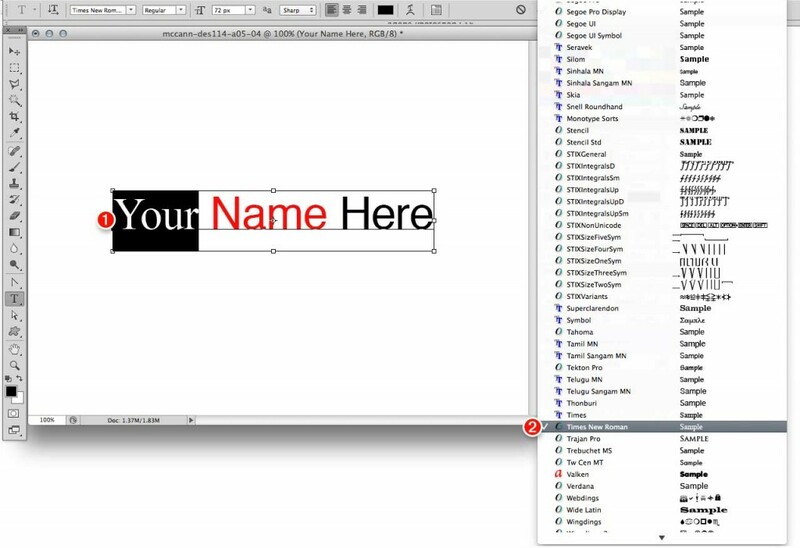 Choose the Horizontal Type or Vertical Type tool, then click a type layer or select the type characters to be resized. On the Options bar, use the Font Size icon as a scrubby slider (Alt-drag/Option-drag for smaller increments), or enter a value, or choose a preset size from the menu. On the Character panel, choose a Font Size. You can also resize type interactively with the Move tool. This is especially useful if your type selection contains different point sizes and you want to preserve those relative differences while resizing. 2. Click the Move tool and check Show Transform Controls on the Options bar. A bounding box with handles appears around the type. To scale both the height and the width of the type, click a corner handle, then drag it. To preserve the original proportions of the characters while scaling them (better! ), Shift-drag a corner handle. 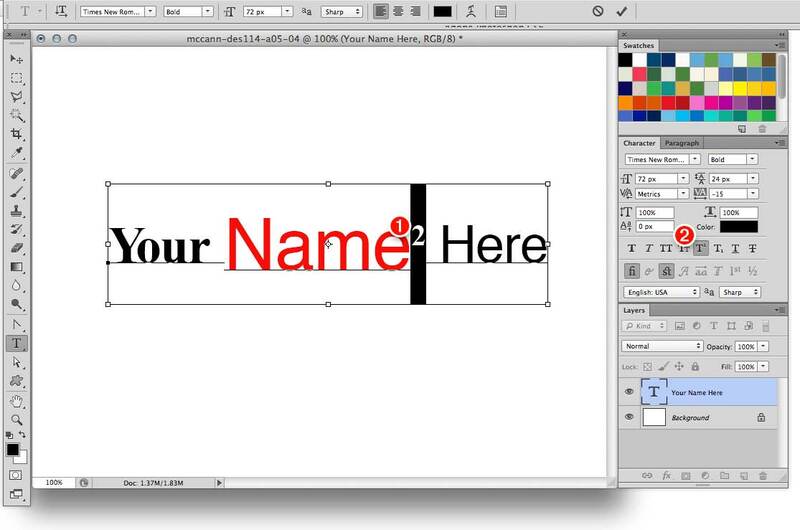 To scale just the height or width of the type, drag a middle handle. To typeset narrow or wide characters, we like to use a condensed or extended font, in which the characters have balanced proportions, instead of the Vertical Scale or Horizontal Scale control on the Character panel, which produces distortion. To change the font size of selected type via the Options bar, use the scrubby slider, enter a value, or choose a preset size from the menu. Another way to change the type size is via the Font Size scrubby slider, field, or menu on the Character panel. To scale type proportionally with the Move tool, Shift-drag a corner handle on the transform box. Kerning changes the spacing between a pair of text characters, whereas tracking changes the spacing between multiple characters. 1. On the Layers panel, double click the icon, then click to create an insertion point between two characters. On the Character panel, choose Metrics from the Kerning menu to apply the kerning value built into the current font, or choose Optical to let Photoshop control the kerning; or use the Kerning icon as a scrubby slider (for finer increments, hold down Alt/Option); or enter or choose a positive or negative value. Press Alt/Option plus the left or right arrow key on the keyboard (to kern in a larger increment, hold down Ctrl-Alt/Cmd-Option while pressing). To restore the spacing between two characters to the kerning setting of Optical, select both characters,then choose Optical from the Kerning menu. To apply tracking to a whole layer, click the layer. To apply tracking to part of a layer, double-click the icon, then select some characters or words. On the Character panel, use the Tracking icon as a scrubby slider (hold down Alt/Option for finer increments) or enter or choose a positive or negative value. If type characters are selected,you can press Alt/ Option and the left or right arrow key (to track in a larger increment, hold down Ctrl-Alt/Cmd-Option). To reset the tracking value of selected characters to 0, press Ctrl-Shift-Q/Cmd-Control-Shift-Q. If Fractional Widths is checked on the Character panel menu, Photoshop uses fractions of pixels to control the spacing of type (on the entire layer), to optimize its appearance. Keep this option checked unless you’re setting small type for Web output. To reset the Character panel and any selected type to the factory-default settings, choose Reset Character from the Character panel menu. Kerning and tracking values can be set on the Character panel or via shortcuts (not on the Options bar). Use a negative kerning value to tighten the gap between a pair of characters (here we chose o value of -100). Tracking can make type more or less readable, depending on the tracking value used. Try not to over do it! On occasion, we might spread out a few words, as in the header in this figure, but never a whole paragraph (that’s a typesetting no-no!). Use the Baseline Shift feature to raise or lower type characters from the normal baseline (1 point at a time). 1. On the Layers panel, double-click the icon, then select the characters or words to be shifted. 2. On the Character panel, use the Baseline Shift icon as a scrubby slider (Alt-drag/Option-drag for finer increments), or enter a value. A positive value raises characters upward; a negative value moves them downward. The OpenType buttons on the Character panel substitute alternate glyphs for standard characters, if available in the current OpenType font. For instance, a fraction glyph would be substituted when you type the characters for a fraction. Among the other possible OpenType options are ligature glyphs for specific letter pairs (such as ff, ffl, and st) and swash and titling characters.The OpenType “Pro” fonts contain the most glyph options. To change all applicable occurrences in existing text, either click a type layer on the Layers panel or highlight characters with a type tool, and if you haven’t already done so, choose an OpenType font family and font style. To specify alternate glyph options for text to be entered in a specific OpenType font, choose a type tool and that font family and style. 2. On the Character panel, click the desired-and available (not dimmed) – OpenType button(s). If the current font doesn’t contain a particular glyph that you’re looking for, you can let Photoshop produce a simulated version of it by clicking the applicable style button on the Character panel. The buttons ore Faux Bold, Faux Italic, All Caps, Small Caps, Superscript, Subscript, Underline, and Strikethrough. Use the Baseline Shift feature to shift characters or words upward or downward by a few points. In these steps, you’ll use a Levels adjustment layer to screen back type. A lightened version of the image will be visible only within the type shapes. This is a very “Photoshoppy” way to combine type with imagery. 1. Create a document that contains a medium to dark image layer and an editable type layer (the type color doesn’t matter), preferably in a large font size and a bold or black font style. 2. On the Layers panel, Ctrl-click/Cmd-click the T icon to load the type as a selection. 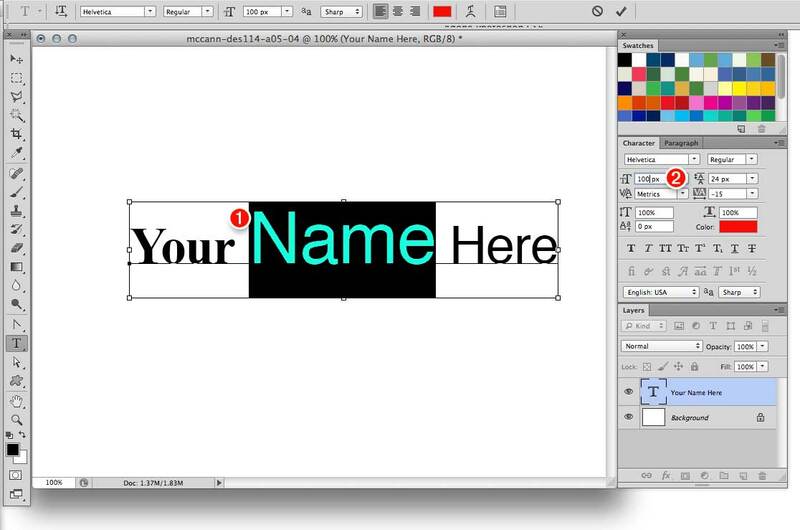 Hide the type layer, then click the underlying image layer or Background. 3. On the Adjustments panel, click the Levels button. The Levels controls display on the Properties panel, and the selection disappears from view. 4. Move the middle input slider to the left to lighten the mid-tones in the type (you can also move the highlights slider). Move the output shadows slider to the right to reduce the contrast in the type. For added depth, apply layer effects to the adjustment layer. Try Inner Shadow, Bevel & Emboss, or Drop Shadow. To reposition the type in the image, click the adjustment layer, then Ctrl/Cmd drag in the document. To screen back the imagery instead of the type, after following the steps above, click the adjustment layer mask thumbnail, then on the Properties panel, click Invert (or press Ctrl-I/Cmd-I).